If you have just dropped in to check out our site please be sure to sign our guest book. We would like to know what you think of our site. Our club will be celebrating it’s 37th year next month and are proud to have numerous members all across the state of Michigan as well as other members across the United States and Canada. Please check our site out and if you would like to join our club please print out and send in the membership form. Hope you enjoy your racing season where ever that may be. P.S. A very special Thank You to the Appalachian Associates for inviting our members up to their suite at MIS over the CART race weekend. We hope all enjoyed the visit. The Michigan Auto Racing Fan Club offers it’s thoughts and prayers to the friends and family of ARCA driver, Dean Roper, who died last Saturday at Springfield, IL. 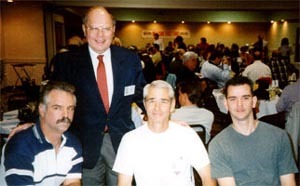 On May 26, 2001, The NAARFC held its annual Convention/Breakfast. 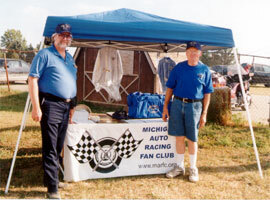 At this convention, auto racing fan clubs from around the country meet to and recognize fan club members for their achievements. 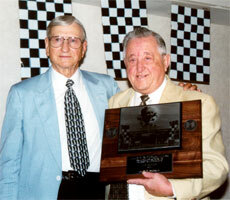 At the 2001 Convention, The Michigan Auto Racing Fan Club’s very own Vito LoPiccolo was awarded the NAARFC Tony Hulman Award. Other MARFC members were on hand to celebrate the occasion with Vito. Congratulations Vito!! NAARFC President, Lee Holst(l), presents the NAARFC Tony Hulman Award to a very surprised and emotional Vito LoPiccolo(r). Above: (l to r)Club members George Adastik, Bill Stone and Jim Buckley. Right: (l to r) Unknown supporter, Paul Anton, Bill Walters, and Bill Walters. 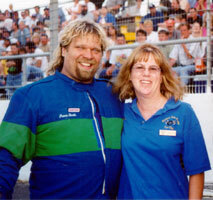 Modified and Late Model driver Travis Smith, shown here with Sue Ginter, was awarded the MARFC helmet/uniform bag. Travis hosts the weekly radio show "Live in the Pits", which airs in the Owosso area on Wednesday nights. Left: Modified driver Steve Doty is presented the MARFC uniform/helmet bag by or very own President, "Wild Bill" Barnhart. Steve has had a run of bad luck this season, the bag was a definite pick me up. Right: Board Member Dave DeHem(l) and Vice President, Bob Michon(r) manned our membership display. 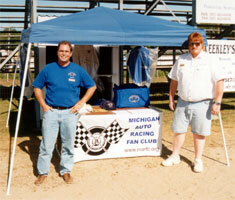 Left: President Bill Barnhart(l) and member Doug Jakeway(r) at the wheel of our Crystal Speedway Fan Club Night. 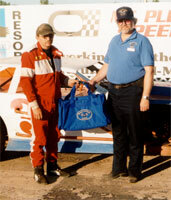 Above: The Prez presenting the MARFC uniform/helmet bag to late model driver, Leroy Magoon. 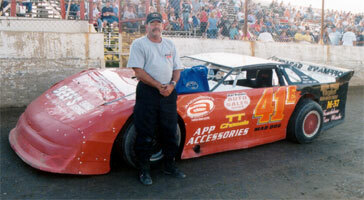 Talk about fast…Leroy has set fas time every night this year in the late model division. 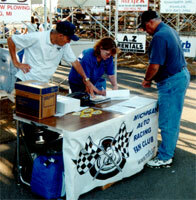 Right: Board Member, Bill Palmer and Secretary/Treasurer, Sue Ginter signing up new members.